This is a Kid's Bowtique original tutu tote bag. This tutu tote bag is perfect for dance class, a Birthday gift, etc. The black canvas bag is approx. 13 X 13 X 3. 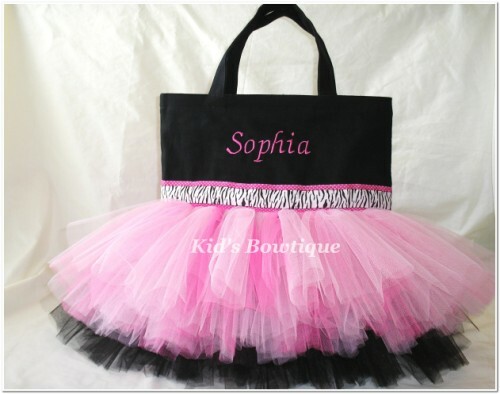 This tutu tote bag has an extra full tutu of pinks and black tulle for uniqueness, pink and black zebra print ribbon for color, and embroidery for personalization! NOTE: We have upgraded the bag from hand handles pictured to longer shoulder straps. If you prefer the shorter handles as pictured please note it at checkout. *Note: Type name exactly how you want it monogrammed on your tutu tote bag.